THE WRITING BUDDHA - Opinions | Books | Movies: 1700* BLOGS in 3358 Days with Lakhs of You!!! What a journey this has been! 1700 Blog Posts! Someone had rightly said that every drop in the ocean counts. When I publish a post late night after the world around me sleeps, at that point of time, I think that I have scribbled just one small piece of article. 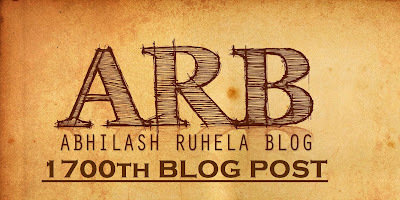 But now when the blog reaches such landmarks of centuries and this one being the 17th century, I realize the importance of all the posts that I have written till date. The people who have been with me through this journey knows the importance of this platform for me as they have witnessed the kind of opportunities and experiences I have been able to live through this. When I started off, I had no expectation from my Blog site. I just wanted to write for myself and end up being as emotional as possible because whenever a person talks with himself, he ends up being emotional as he goes deeper into his conscious and search for those answers which he has been awaiting since time immemorial. Recently, I changed the domain name from my personal name to the label “Writing Buddha”. This was done after a lot of thinking. I have lost many count of readers because of this as their subscription or bookmark got affected and they never landed up on this domain. I tried reaching out to as many readers as possible informing them about this update but as you know, you can’t reach everyone you love when distance becomes the medium of separation. The name of the blog was changed just because I realized after a time that people do not have any interest about me as a specific human being, but they are interested about the personality that speaks. And my personality could not have been summed up better than the two words used in the domain “Writing Buddha”. Writing has always been my hobby but as a personal conversational stuff and not something creative. But since I changed many cities and ended up being friendless in the year 2009 when I shifted to Mumbai, I thought of talking only with myself through the medium of writing. But I never knew that it would become such an addiction that I would also start talking with others sometimes. And the conversations with others became so interesting that I started telling everyone about the books and movies I read and watched respectively. People started liking my opinion and this gave the boost to my blog which was never expected. And then came opportunities when I became friends with authors whom I would idolize at one point of time. And now writing is not just a hobby but a very bad or say, good addiction which can never leave me. This is how the first word in the label got introduced. While writing about certain topics very specific to me, I realized quite often that I would reach the state of mind where I would forget very thing about me and my surroundings and become blank. At this point of time, it would be me controlling my mind and letting it think things that I wanted it to think. This is when I realized that there is something beyond our knowledge. It is when I understood the importance of the quote “Ignorance is bliss”. I became ignorant and started knowing the concept of human mind and got to know so much about spirituality that nothing in the world was able to stop me from going on the path of meditation and yogi lifestyle. Now, I read and experience the possibilities of the human mind and the highest potential it can reach to become joyful and control its own life. Along with writing, now even spirituality has become a path of which I would always like to walk. And this is how the second word in the label got introduced- “Buddha”. Today is the 3358th day of this Blog and reaching out to all of you with 1700 blog posts with a post coming within two days since all these 9 years is something that has kept me energized during my college days and now it helps me professionally. Whenever something goes wrong in my workplace, I remember this beautiful piece of life I have created and read whatever comments I receive from my readers. I get to learn so much from the same that next time when I sit to write, I find myself an improved blogger since the last time. The kind of experiences that my readers share with me against any of my personal posts is what makes me write after every two days. This is a medium that shall stay even after me. Who does not want to create something like this? I am glad I did. The only dream now is to reach as many people as possible because I want to talk with more people and learn more and live more. In the end, I thank you all for being patient with me since all these years and forgiving me every time I wrote something with which you disagreed but still ensured that we had healthy discussion about it rather than ending the association with each other.